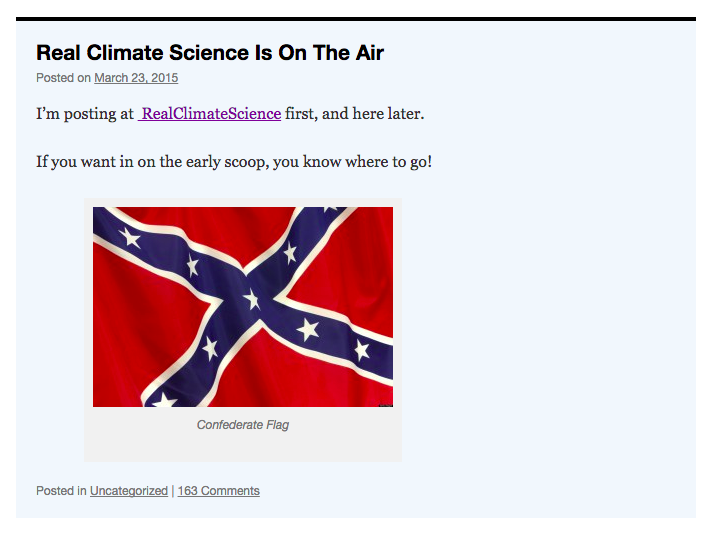 You would think I’d be worried that displaying the Confederate flag would hurt my credibility in the debate over climate change. But you’d be wrong. In fact, I’m at the height of my popularity and the more over the top and outrageous I am and the more I politicize climate science, the more popular I get. My voice is echoing across Fox News, the Heartland Institute, Drudge, NewsMax, The Blaze and hundreds of other third-rate news sites and blogs. Hell, I even have a real climatologist, Judith Curry, making my garbage the subject of serious inquiry. And my website traffic and Twitter follower metrics are through the roof. What’s going on here? How is a crackpot like me getting so much traction? The answer is that I don’t actually debate climate science. Instead, climate change is just the vehicle I use for running progressives and liberals over. And in the process of generating my junk science, I discovered it fulfills a need. You see, my audience doesn’t care about the science of global warming, they care about either a) defending the worldview they are deeply attached to and hating on liberals or b) attracting eyeballs by signaling a particular worldview to the audience they are trying to attract. If my “science” is full of holes and withers under even cursory scrutiny, who really cares? It’s good enough to do the job of attacking the left or increasing ad revenues. I’m just supplying the ammunition to load other people’s ideological guns. There’s no debate about the reality of global warming between actual climate scientists and I’m not really interested in it. For me, this is about seizing the issue to smash the left in the face and helping others do the same. And for many others, not believing in climate change is just a way to signal to the world you don’t trust the government and liberals. And so for many people, a position on climate change is nothing more than a cultural identifier. I fly the confederate flag on my website to attract that kind of audience. It’s a tribal symbol. When right-wingers see it on my website, they know they’ve found a source of information they can trust. The debate over climate change is also about winning elections. Because if you’re a conservative foolish enough to say you think liberals are right about climate change then you can kiss your election prospects goodbye. In order for any Republican to win, they have to come out against any policies designed to counteract climate change. The political debate over climate change is now also a litmus test for campaign donors. My conservative buddies and I want politicians who are willing to say anything to get elected no matter how ridiculous. In other words, candidates who are easy to control. And if you don’t believe that, then go read about Senator Ted Cruz repeating my lies about the fudging of temperature data at a Koch brothers forum for Republican presidential candidates. So what’s it going to take to get people to move on climate change? How can climate realists win the debate? Probably the same way the debate over gay marriage was won: through popular culture. Until more cultural icons and creatives start speaking out on this issue, my side will continue to be able to keep this debate mired in the cultural war for a long time to come. My advice to climatologists is to start mingling with executives, writers, and actors in Hollywood. Until then, look away, look away, look away, Dixie Land! As a climate $cientologist I believe that anybody who disagrees with me is a racist. Our great leader L. Ron Obama is trying to cut our 5% emissions by 1/3 or 1.67% over 15 years. There should not be any debate that cutting US carbon by 0.1% each year for the next 15 years will totally cancel out the new coal plants being built by China every 10 days. The science is settled. The debate is over. Good to see that you’re finally coming to your senses. Your tired old meme about China’s coal plants is a decade out of date. China’s coal use FELL by 4% last year and they installed more wind and solar in ONE YEAR than has been installed in the USA in total ever. Not that I’m a fan of the Chinese you understand but if you are going to spout garbage at least come up with some new stuff. It’s true that their economic slowdown resulted in less emissions. But the commies have no intention of reducing emissions. By 2030 they plan on tripling emissions per the agreement with Obama. Look, just another climate revisionist. One of those lying criminals who equate ‘slowdown of economic growth’ with ‘slowdown of economy’ just to fool us into believing there’s therefore and only therefore a ‘slowdown of coal burning’ in China. This lying criminal may rectify. -4% coal use during economic growth of ‘only’ 7% and a little bit, do it, criminal. “…China has a history of ironing out the ruffles in its growth figures. No less an authority than Li Keqiang, now the premier, once said that local GDP data were “man-made and therefore unreliable”. “One, carbon dioxide is not a pollutant. CO2 emissions have not warmed the planet or changed its climate in any catastrophic — or even discernible — sense. Please, bucephelus, spare the world of that kind of thuggery. With over 7% growth of that economy, a 2% drop in CO2 emissions last year already. So that deal is busted quite the other way round. You are way behind on the discussion. Ignoring my comments and reposting the same thing again isn’t an effective rebuttal. Simply accept the rebuttal. Chinese growth 2014 was a bit over 7% but emissions dropped by 2%. Western underestimation of China has me LOLlingMAO for 15 years now. Riiight….I’m sure that 7% percent figure is totally on the up-and-up. Check out their stock market for the truer picture. It’s harder for the government to tamper with that. Their economy has basically stopped. You’ve convinced me dude. I’m going to believe some blog commenter over the Economist and other reputable news outlets. In fact I now believe Chinese GDP was 15 or 20%. Might as well go big.